"Derby Day is the most formal of the weeklong events and as such, is reserved for the finest clothing." With racing season upon us, there is nothing more thrilling than the first day of the Melbourne Cup Carnival: Derby Day. 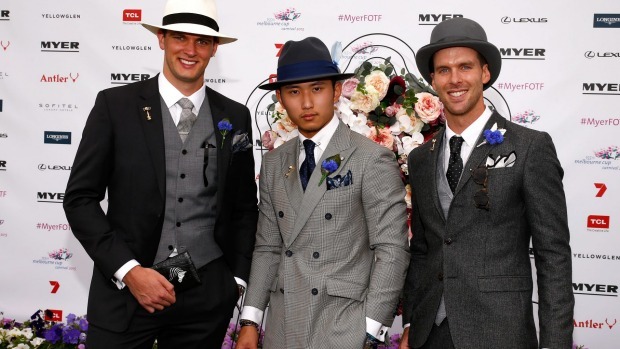 A social occasion as much as a race meet, Derby Day is the most formal of the weeklong events and as such, is reserved for the finest clothing. On the first Saturday of the Carnival, members of the VRC are required to wear morning dress in the members' enclosure. Traditionally, this comprises a black morning tailcoat, grey striped side-fastened trousers, a peacock-coloured vest and a top hat. Not to forget the official flower of the day, the cornflower, fixed into the buttonhole. Nowadays, there's flexibility on the colour of the waistcoat and whether one chooses to wear a top hat. Although, one seldom receives the opportunity to dress so traditionally (with the exception of formal weddings and Royal Ascot), so all gentlemen should leap at the opportunity. For non-members, the dress code isn't quite as formal, with the traditional black-and-white theme employed by most racegoers. 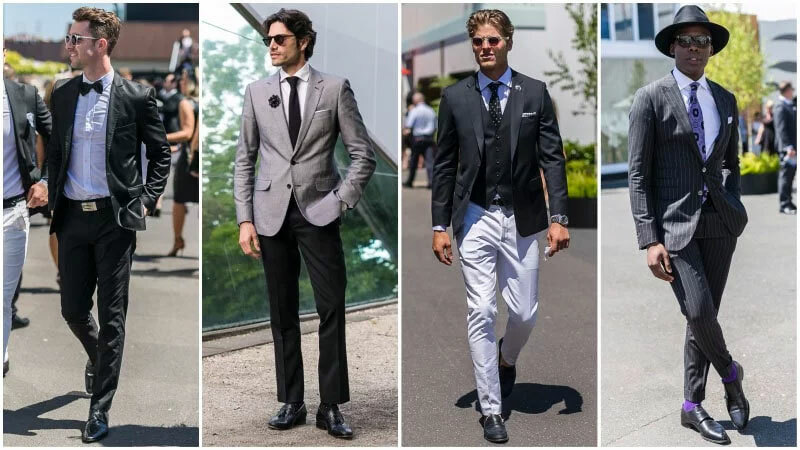 The monochrome palette isn't as plain as it sounds; it effectively gives you a framework in which to plan a splendid outfit. While it's not a hard-and-fast rule, it pays to adhere to the suggested dress code for fear of feeling left out on the day. Black doesn't mean just a black suit, it includes patterns, textures and sophisticated tailoring. When planning your suit with your tailor, be sure to inform him of the occasion and he will suggest ways that you can make black more exhilarating. A subtle check through the suit's cloth will give it some texture, and play with the light in unexpected ways. A herringbone has a similar effect, but a texture of a different variety; it elongates the frame and cinches the waist optically. Accessories are another way to enjoy the black-and-white theme without being overly literal. A simple white pocket square is a subtle nod to the theme, without going overboard. If you're more adventurous, a houndstooth pocket square or necktie is a fun monochrome nod. Not forgetting the cornflower, subtle cornflower blue-coloured accessories can lift your look and keep it within theme. Derby Day is one day of the year to look exceptional; Oscar Hunt Tailors know how to create the best look from your imagination. Talk to your tailor about your plans and allow us to create the black-and-white theme of your dreams.